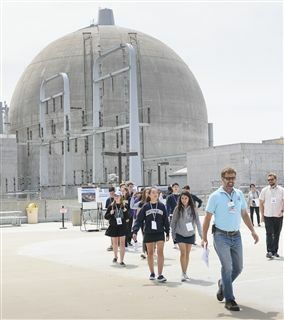 After finishing up a nuclear energy unit in chemistry, 10th graders toured the San Onofre Nuclear Generating Station on April 24. The strict security at the plant meant students didn't actually go inside during their tour, but they still saw plenty. The entire grade split up into small groups to tour the facility, which is in the process of being decommissioned. Engineers discussed challenges they face with federal and state legislation while biologists talked about measures they take to keep the wildlife and flora in the area safe. Students also got a look at the storage construction for the spent fuel cells and learned about electrical safety.